Iconfinder has high quality requirements and we expect higher quality works from our contributors each time. 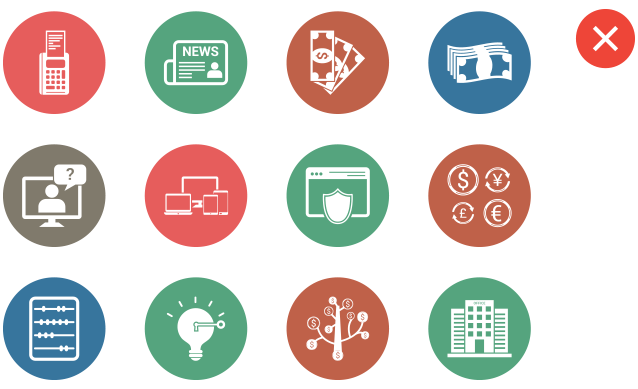 Quality is one of the Criteria for approving icons that our Content review team follows. There are a few pitfalls that can make icons be of low quality, as described below. 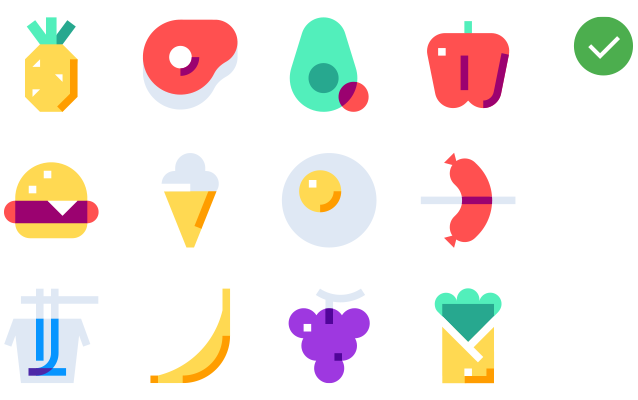 You need to take into account that icons should be designed with the idea that they will be used in different sizes and instances so making them recognizable is one of the key things. Its important to set a style that you want to go with from the start (rounded corners, certain line cuts, colors...) and try and stick with them within the icon set. Refinement is also important so please spend time and refine details of the icons by making sure that lines/elements are not clashing, forming shapes are nicely spaced and everything looks well constructed. In the above example you can see that there is a lack of refinement and no set style within the set. The use of different background colors does not help. In the above example you can see how refinement and style can define an icon set. Keeping things clean and in a nice order is not what makes an icon great by default but it can hurt it for sure when things are rushed. Elements should be aligned consistently between themselves and within the art board. You can read more about alignment and art boards here. In the above examples you can see how elements are not aligned within the icon (left) and one example where the icon is not aligned within the artboard (right). Looking for shortcuts and way to cut down the time needed to design icons is a natural thing but should be avoided when it affects the quality. Conversions from a style to another style is, in many cases, a trap and can result in poor quality icons if no extra care and attention is taken. The most common direct style conversion is from outline to glyph. When one designs glyph icons, the solid shapes are used to define areas of light and shadow without relying on lines. In the case of outline, using lines to define a shape uses a completely different approach: rather than using light and shadow to define the edges of an object, the edges of the object are outlined without regard to light and shadow. The two approaches are mutually-exclusive and converting an outline icon directly to glyph, without any adaptation, doesn't look good. In the above examples, you see a good example of line to glyph conversion and a bad example too. Simple conversion from outline to glyph is not working on all icons so you should take extra care and make sure they are recognizable. While on some cases this makes sense, you should avoid using text on icons. If you really need to use text, then make sure it matches the style of the icons. It's also important to note that using text means that you should use a language and this might limit the icon use to people interested only in icons in that language. Icons, by definition, should be universal and using text restricts their usability potential. A lot of times you might try to bring variety to your set but, without realizing, you end up with an inconsistent set. 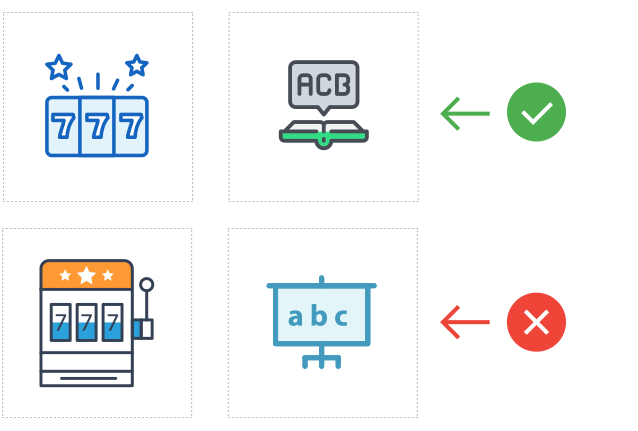 Consistency is an important thing to keep in check while designing your icons. 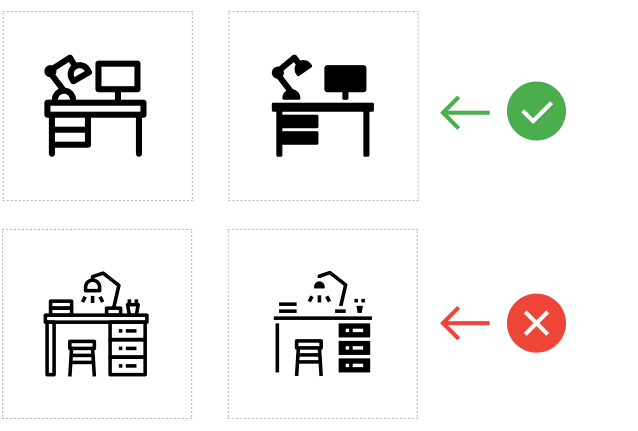 Make sure you are using line weights, colors, shapes in a consistent way through the icon set. You can read more about Consistency. In the above example there is a lack of consistency in style, wrongly using almost all styles (outline, glyph, flat). This makes the icon set unmemorable and hard to use on a project where consistency is essential. In the above example you can see a consistent design style which makes the icons original and memorable. 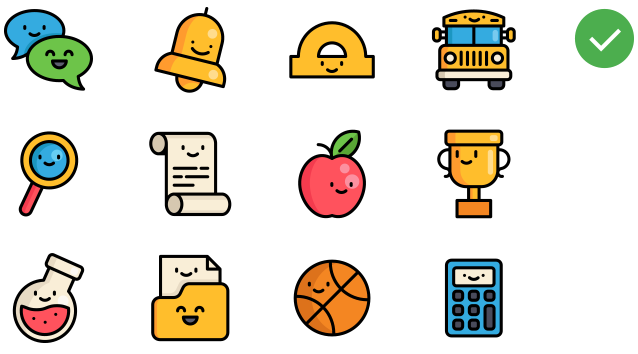 To get an idea of what we consider as high quality icons, you can check the Featured icon sets and the work of Top selling designers and use these as reference. 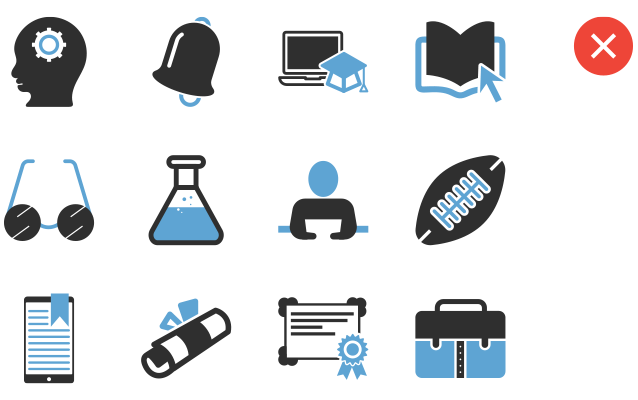 Remember to check out all our Criteria for approving icons.